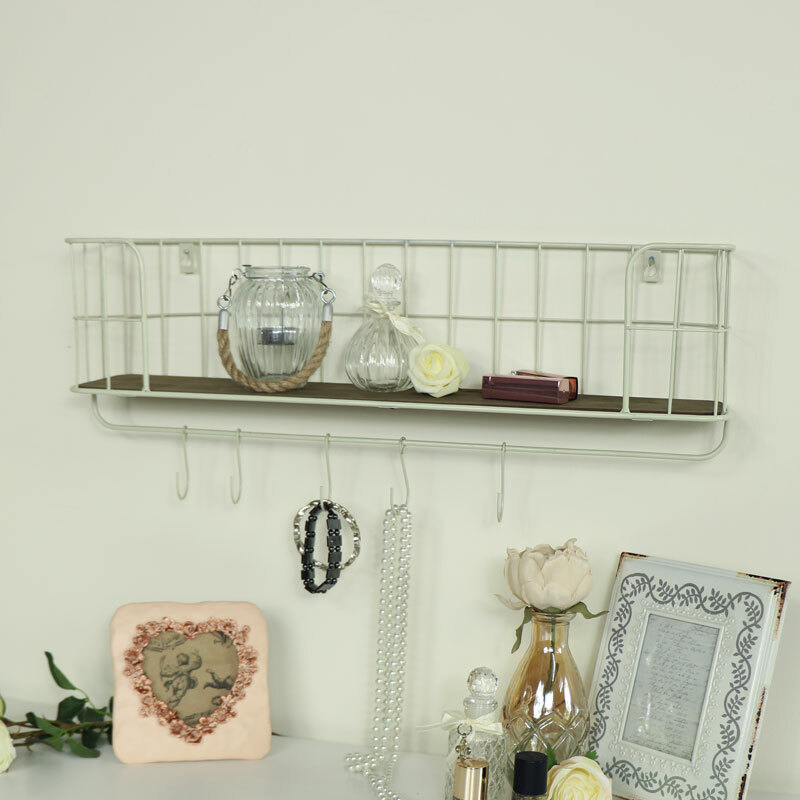 Cream wire metal framed wall shelf for kitchen or bathroom storage. The shelf makes ideal storage with a single wooden ledge and hooks below. Wall mounted design, the shelf will easily hold toiletries, bottles and other bits & bobs in the bathroom or bottles, condiments & tins in the kitchen with the 5 metal hooks ideal for hanging towels. With a great choice in accessories for the kitchen and bathroom from wall shelves to cabinets in a wide choice of colours and styles. Cream wire metal framed wall shelf for kitchen or bathroom storage. The shelf makes ideal storage with a single wooden ledge and hooks below. 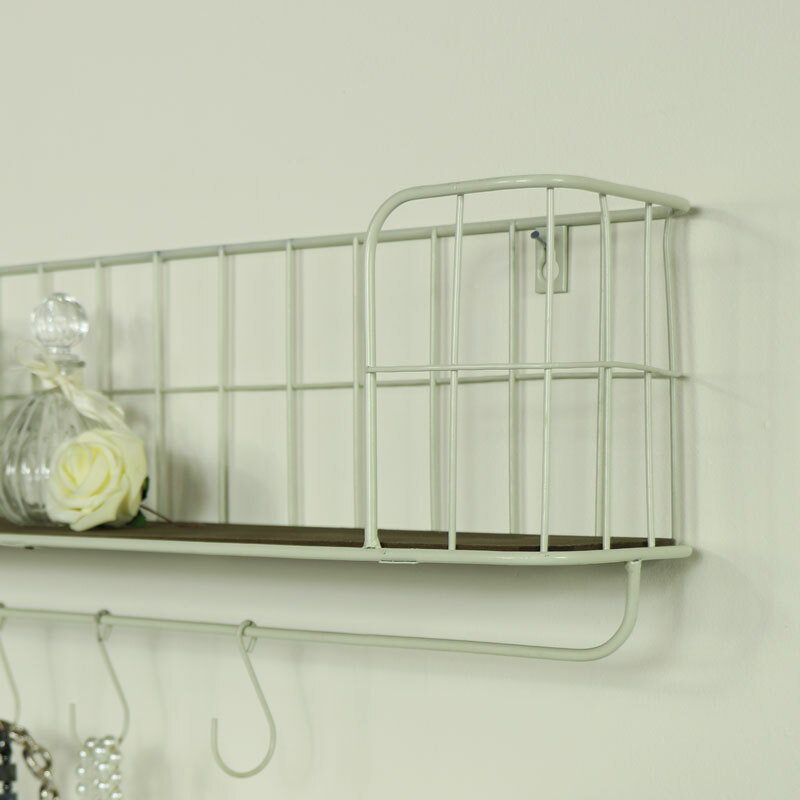 Wall mounted design, the shelf will easily hold toiletries, bottles and other bits & bobs in the bathroom or bottles, condiments & tins in the kitchen with the 5 metal hooks ideal for hanging towels. With a great choice in accessories for the kitchen and bathroom from wall shelves to cabinets in a wide choice of colours and styles. Constructed with a wire metal frame in a cream painted finish and wooden shelf. Easily wall mounted with 2 holes on the back for attached to wall screws (not included). We have a fantastic range of gifts and home accessories for you to browse through so you can create just the home you want.